I have spent some time packaging software as Debian packages. While the Debian packaging system has its faults, it has the nice property that it is modular. This post is an attempt to articulate what aspects of Debian packaging -- and other modular build systems -- are worth replicating, and why it is worth co-operating with these systems rather than ignoring them or working around them. What is a modular build? each of which can be built separately. Each module's build produces some output (a directory tree). A module may depend on the outputs of other modules, but it can't reach inside the others' build trees. There is a common interface that each module provides for building itself. The build tool can be replaced with another. The description of the module set is separate from the modules themselves. What is a non-modular, monolithic build? A monolithic build consists of one big build tree. Any part of the build can reference any other part via relative filenames. It might consist of multiple checkouts from version control, but they have to be checked out to specific directory tree locations (as in the Chromium build). XFree86 (and Xorg 6.9): Before Xorg was modularised, there was a big makefile that built everything, from Xlib to the X server to example X clients. Chromium web browser: This uses a tool called "gyp" to generate a big makefile which compiles individual source files from several libraries, including WebKit, V8 and the Native Client IPC library. It ignores WebKit's own build system. Native Client: One SCons build builds the core code as well as the NPAPI browser plugin and example code; it needs to know how to cross-compile NaCl code as well as compile host system code. Another makefile builds the compiler toolchain from tarballs and patch files that are checked into SVN. CPython: The standard library builds many Python C extensions. You can download and build only the parts you need. This can be a big help if some modules are huge but seldom change while the modules you work on are small and fast to build. Some systems (such as Debian packages) give you binary packages so you don't need to build the dependencies of the modules that you want to work on. JHBuild doesn't provide this but it could be achieved with a little work. External interfaces are clearer too. It is possible to change one module's version independently of other modules (to the extent that differing versions are compatible). They are relatively easy to use in a decentralised way. It is easy to create a new version of a module set which adds or removes modules. You don't have to check huge dependencies into your version control system. Some projects check in monster tarballs or source trees, which dwarf the project's own code. If you avoid this practice you will make it easier for distributions to package your software. The two categories can coexist: Each module may internally be a monolithic build which can be arbitrarily complex. Autotools is an example of that. This is not too bad because at least we have contained the complexity within the module. The layer on top, which connects modules together, can be relatively simple. The build tree does not need to be kept around after doing "make install". Output can be directed using "--prefix=foo" and "make install DESTDIR=foo". Inputs can be specified via --prefix and PATH and other environment variables. The build tree can be separate from the source tree. It's easy to have multiple build trees with different build options. The systems I listed as modular all have their own problems. The main problem with Debian packages is that they are installed system-wide, which requires root access and makes it difficult to install multiple versions of a package. It is possible to work around this problem using chroots. JHBuild, Zero-Install and Nix avoid this problem. JHBuild and Zero-Install are not so good at capturing immutable snapshots of package sets. Nix is good at capturing snapshots, but Nix makes it difficult to change a library without rebuilding everything that uses it. Despite these problems, these systems have a nice property: they are layered. It is possible to mix and match modules and replace the build layer. Hence it is possible to build Xorg and GNOME either with JHBuild or as Debian packages. In turn, there is a choice of tools for building Debian source packages. There is even a tool for making sets of Debian packages from JHBuild module descriptions. These systems do not interoperate perfectly, but they do work and scale. There are some arguments for having a monolithic system. In some situations it is difficult to split pieces of software into separately-built modules. For example, Plash-glibc is currently built by symlinking the source for the Plash IPC library into the glibc source tree, so that glibc builds it with the correct compiler flags and with the glibc internal header files. Ideally the IPC library would be built as a separate module, but for now it is better not to. Still, if you can find good module boundaries, it is a good idea to take advantage of them. In the first case, it is possible to do open(filename).read() instead of read_file(filename). However, this is not good practice because if you are using a Python implementation that uses a garbage collection implementation other than reference counting, there will be a delay before the Python file object, and the file descriptor it wraps, are freed. So you will temporarily leak a scarce resource. I have sometimes argued that GC should really know about file descriptors: If the open() syscall fails with EMFILE or ENFILE, the Python standard library should run GC and retry. (However this is probably not going to work for reliably receiving FDs in messages using recvmsg().) But in the case of read_file() it is really easy to inform the system of the lifetime of the FD using close(), so there is no excuse not to do so! In the second case, again it is possible to do open(filename, "w").write(data) instead of write_file(filename, data), but in the presence of non-refcounting GC it will not only temporarily leak an FD, it will also do the wrong thing! The danger is that the file's contents will be only partially written, because Python file objects are buffered, and the buffer is not flushed until you do close() or flush(). If you use open() this way and test only on CPython, you won't find out that your program breaks on Jython, IronPython or PyPy (all of which normally use non-refcounting GC, as far as I know). Maybe CPython should be changed so that the file object's destructor does not flush the buffer. That would break some programs but expose the problem. Maybe it could be optional. read_file() and write_file() calls also look nicer. I don't want the ugliness of open-coding these functions. Until Python includes these functions in the standard library, I will copy and paste them into every Python codebase I work on in protest! They are too trivial, in my opinion, to be worth the trouble of depending on an external library. I'd like to see these functions as builtins, because they should be as readily available as open(), for which they are alternatives. However if they have to be imported from a module I won't complain! Guido van Rossum's criticisms of CapPython from earlier in the year are largely right, though I would put the emphasis differently. A lot of existing Python code will not pass CapPython's static verifier. But I was not expecting large amounts of code to pass the verifier. CapPython was an experiment to see if Python could be tamed using only a static verifier - similar to Joe-E, a subset of Java - without resorting to automated rewriting of code. I had a hunch that it was possible. I also wanted a concrete system to show why I preferred to avoid some of the Python constructs that CapPython prohibits. Some of Joe-E's restrictions are also quite severe, such as prohibiting try...finally in order to prevent non-deterministic execution (something, incidentally, that CapPython does not try to do). It turned out that it was better to abandon the goal of being static-only when it came to loading Python modules. My goal was that CapPython code should look like fairly idiomatic Python code (and be able to run directly under Python), not that all or most idiomatic Python code would be valid CapPython code. As a consequence, I didn't want CapPython to require special declarations, such as decorators on classes, for making objects encapsulated. Instead I wanted objects to be encapsulated by default. Maybe that was an arbitrary goal. CapPython managed to meet that goal, but only partially, and only by depending on Python 2.x's unbound methods feature, which was removed in Python 3.0. The reason my goal was met only partially is that in some circumstances it is necessary to wrap class objects (using a decorator such as @sealed in my earlier post) so that the class's constructor is exposed but inheritance is blocked. Whether this is necessary depends on whether the class object is authorityless. A class object is authorityless if it does not reference any authority-carrying objects (directly, or indirectly through objects captured by method function closures). If a class object is authorityless, it should be safe to grant other, untrusted modules the ability to create derived classes. Otherwise, the class object ought to be wrapped. The problem is that it is not trivial to make this determination. Furthermore, permitting inheritance is the default, and this is not a safe default. If we have to go around putting @sealed decorators on all class definitions because the non-@sealed default is not-quite-encapsulated, we may as well consider alternatives where the default is not-at-all-encapsulated. The main alternative is to resurrect CPython's restricted mode and add a wrapper type for making encapsulated objects (i.e. a non-broken version of Bastion along the lines of my earlier post). If modifying CPython is considered acceptable, and one's goal is to add object-capabilities to Python in the most practical way (rather than to investigate a specific approach), resurrecting restricted mode is probably a better way to do it than CapPython. Last year I wrote about a couple of features that I'd like to see in a hypothetical integrated shell and terminal. Since then I have implemented my idea! The result is Coconut Shell. It is a combined shell and terminal. It is intended to look and behave much the same as Bash + GNOME Terminal. I am now using it as my main shell/terminal. Now I no longer have to keep checking minimised windows to see whether a build has finished or whether packages have finished downloading and installing. 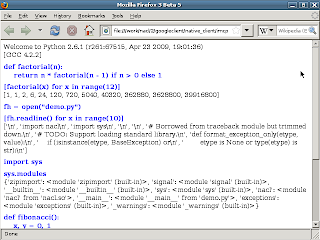 Coconut Shell is implemented in Python. The terminal and shell run in the same process. It uses libvte to provide the terminal emulator widget -- the same as GNOME Terminal. It uses Pyrepl as a readline-alike to read commands from the terminal. Normal shells rely on Unix process groups to stop backgrounded jobs from reading from the terminal. Coconut Shell doesn't rely on process groups in the same way. Instead, it creates a new TTY FD pair for every command it launches, and it forwards input and output to and from the terminal. This is partly out of necessity (process groups get in the way of reading from multiple TTY FDs at the same time), and partly because it is more robust. It stops jobs from interfering with each other and making themselves unbackgroundable. It also demonstrates that Unix never needed the whole sorry mess of process groups and session IDs and the weirdness they inflict on TTY file descriptors, because job control can be done by forwarding IO instead. There's more information on the home page. I find that postmortem debugging is useful (e.g. examining process state in gdb or pdb after a crash or traceback), but trying to debug using breakpoints is an exercise in tedium. I prefer debugging using logging. However, logs obtained just by adding printf statements tend to lack context information, and if you add lots of printfs the logs require more effort to read. You can get context information in Python by doing traceback.print_stack() after every message, but the result tends to be unreadable. Below is a tool which prints stack context in a more readable tree format. I found it very useful a couple of months ago when investigating a bug in which a recursive invocation of a callback function caused failures later on. Had I not seen the stack context, I might not have realised that the callback was being called recursively. Here is some example output. It comes from running the Tahoe client, while monkey-patching some socket functions to show which sockets the process is binding and connecting to. """Outputs a log message with stack trace context.""" This makes use of the fact that Python's stack frames are heap-allocated, so they have identity, and it is possible to hold on to a stack frame object after the frame has exited. This means it is possible to distinguish between two different invocations of the same function, even when the tracebacks are textually identical. This would not be possible in C -- gdb would have to approximate. I read about eXplode in early 2007. The paper describes a neat technique, inspired by model checking, for exhaustively exploring all execution paths of a program. The difference from model checking is that it doesn't require a model of the program to be written in a special language; it can operate on a program written in a normal language. The authors of the paper use the technique to check the correctness of Linux filesystems, and version control systems layered on top of them, in the face of crashes. The basic idea is to have a special function, choose(), that performs a non-deterministic choice, e.g. Conceptually, this forks execution into three branches, returning 1, 2 or 3 in each branch. The program can call choose() multiple times, so you end up with a choice tree. The job of the eXplode check runner is to explore that choice tree, and to try to find sequences of choices that make the program fail. This replay technique means that the program must be deterministic, otherwise the choice tree won't get explored properly. All non-determinism must occur through choose(). You can call choose() from your test code to generate input. In eXplode, the test program writes files and tries to read them back, and it uses choose() to pick what kind of writes it does. In one case, I started with valid input and mangled it in different ways, to check the error handling of the software-under-test. The test code used choose() to pick a file to delete or line to remove. The idea was that the software-under-test should give a nicely-formatted error message, specifying the faulty file, rather than a Python traceback. There was only a bounded number of faults to introduce so the choice tree was finite. In another case, I built up XML trees to check that the software under test could process them. In this case the choice tree is infinite. I decided to prune it arbitrarily at a certain depth so that the test could run as part of a fairly quickly-running test suite. In both these cases, using the eXplode technique wasn't strictly necessary. It would have been possible to write the tests without choose(), perhaps by copying the inputs before modifying them. But I think choose() makes the test more concise, and not all objects have interfaces for making copies. You can also call choose() from the software-under-test to introduce deliberate faults, or from a fake object that the software-under-test is instantiated with. In eXplode, the filesystem is tested with a fake block device which tries to simulate all the possible failures modes of a real hard disc (note that Flash drives have different failure modes!). The fake device uses choose() to decide when to simulate a crash and restart, and which blocks should be successfully written to the virtual device when the crash happens. You can also wrap malloc() so that it non-deterministically returns NULL in order to test that software handles out-of-memory conditions gracefully. Testing error paths is difficult to do and this looks like a good way of doing it. In these cases, the calls to choose() can be buried deeply in the call stack, and the eXplode check runner is performing an inversion of control that would be hard to do in a conventional test case. # If anyone catches and handles this, it will break the checking model. # - along with the choices that caused it - and then carry on. # do it here for testing purposes. Time for another post on how object-capability security might be done in Python. 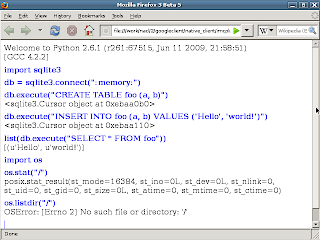 Suppose function closures in Python were encapsulated (i.e. the attributes func_closure, func_globals etc. were removed) and were the only route for getting encapsulation for non-builtin objects, as is the case in Python's old restricted mode (a.k.a. rexec). There would be two ways of defining new encapsulated objects. Let's call them the Cajita approach and the Bastion approach. A function can only assign to a variable in an outer scope by using the nonlocal declaration (recently introduced), and that is awkward. The example works around this by doing "self = Namespace()" and assigning to the attribute self.i. The Cajita style also has a memory usage cost. The size of each object will be O(n) in the number of methods, because each method is created as a separate function closure with its own pointer to the object's state. This is not trivial to optimise away because doing so would change the object's garbage collection behaviour. For these reasons it would be better not to use the Cajita style in Python. # Minimal version of Bastion.BastionClass. # Converts a function closure to an object. # Minimal version of Bastion.Bastion. # Create a function closure wrapping the object. One problem with the Bastion approach is that Bastion's wrapper objects are mutable. Although you can't use the Bastion object to change the wrapped object's attributes, you can change the Bastion object's attributes. This means that these wrapper objects cannot be safely shared between mutually distrusting components. Multiple holders of the object could use it as a communications channel or violate each other's expectations. There isn't an obvious way to fix this in pure Python. Overriding __setattr__ isn't enough. I expect the simplest way to deal with this is to implement Bastion in a C extension module instead of in Python. The same goes for ImmutableNamespace (referred to in the first example) - the Cajita-style approach faces the same issue. There is a potential hazard in defining encapsulated objects via wrappers that is not present in CapPython. In methods, "self" will be bound to the private view of the object. There is a risk of accidentally writing code that passes the unwrapped self object to untrusted code. This hazard is something we could lint for. It would be easy to warn about cases where self is used outside of an attribute access. This creates a new wrapper object each time which is not always desirable. To avoid this we could store the wrapper object in an attribute of the wrapped object. Note that that would create a reference cycle, and while CPython's cycle collector is usually fine for collecting cycles, creating a cycle for every object might not be a good idea. An alternative would be to memoize seal_object() using a weak dictionary. The Python standard library now works under Native Client in the web browser, including the Sqlite extension module. By that I mean that it is possible to import modules from the standard library, but a lot of system calls won't be available. Sqlite works for in-memory use. Changing fstat() in NaCl so that it doesn't return a fixed inode number. Python uses st_ino to determine whether an extension module is the same as a previously-loaded module, which doesn't work if st_ino is the same for different files. Some tweaks to nacl-glibc-gcc, a wrapper script for nacl-gcc. Ensuring that NaCl-glibc's libpthread.so works. I didn't have to modify Python or Sqlite at all. I didn't even have to work out what arguments to pass to Sqlite's configure script - the Debian package for Sqlite builds without modification. It's just a matter of setting PATH to override gcc to run nacl-glibc-gcc. Time for me to follow up my previous blog post and explain the code snippets. Although you might expect this Python code snippet to print "1 2 3", it actually prints "3 3 3". The reason for this is that the same mutable variable binding for x is used across all iterations of the loop. The for loop does not create new variable bindings. The function closures that are created inside the loop do not capture the value of x; they capture the cell object that x is bound to under the hood (or the globals dictionary if this code snippet is run at the top level), and each iteration mutates the same cell object. This problem is Python's variable binding semantics is not specific to lambdas and also occurs if you use def. This also prints "3 3 3". The remaining snippets are examples of ways to work around this problem. They print the desired "1 2 3". This is actually the trick that was used to get the effect of lexical scoping before lexical scoping was added to Python. The default argument captures the value of x at the point where the function closure is created, and this value gets rebound to x when the function is called. Although it is concise, I'm not too keen on this workaround. It is an abuse of default arguments. There is a risk that you accidentally pass too many arguments to the function and thereby override the captured value of x. This is quite an ugly workaround, but it's perhaps the most general one. The loop body is wrapped in a function. The x inside function g and the x outside are statically different variable bindings. A new mutable binding of x is created on every call to g, but this binding is never modified. The remaining two snippets are attempts to make the code less ugly, by giving names to the intermediate functions that are introduced to rebind x and thereby give the desired behaviour. I suppose there is a downside to de-uglifying the code. If the code looks too normal, there's a risk that someone will refactor it to the incorrect version without testing that it works properly when looping over lists containing multiple items. Can the language be fixed? It should be possible to create a lint tool to detect this hazard. It could look for closures that capture variables that are assigned by or in loops. I wonder how many false positives it would give on a typical codebase. This code prints "3 3 3" when run using rhino. Back to Python. The same problem also applies to list comprehensions and generator expressions. These both print "3 3 3". But for generators (and for list comprehensions in Python 3.0), the scope of x is limited to the comprehension. Semantically, it would be easy to limit the scope of x to within a loop iteration, so that each iteration introduces a new variable binding. What do the six following chunks of code do, and what would you like them to do? Which do you prefer? I tried out OpenStreetMap the other day after reading the recent article about it on LWN. Amazingly it looks pretty complete for the parts of the UK and US that I looked at. I don't know how much comes from people gathering data by travelling around or by entering data from satellite photos or out-of-copyright maps, but whichever of these it is, it's very impressive. It has more details: it shows footpaths, rivers and streams, wooded areas, and paths across parks. It has outlines of interesting buildings where people have entered data for them. I think the default renderer (Mapnik) looks better than the Google Maps equivalent, especially when zoomed out to a level where streets are one pixel thick but still distinguishable. Google Maps gives too much prominence to the major roads -- it renders them thickly, in bright colours, and with large labels, which tends to drown out the details. Mapnik is more subtle. The map just looks more interesting. It uses more of the browser window and doesn't waste as much space on sidebars. It's almost a trivial point, but it makes a difference. This is the third post in a series about automated testing in Python (earlier posts: 1, 2). This post is about testing using golden files. A golden test is a fancy way of doing assertEquals() on a string or a directory tree, where the expected output is kept in a separate file or files -- the golden files. If the actual output does not match the expected output, the test runner can optionally run an interactive file comparison tool such as Meld to display the differences and allow you to selectively merge the differences into the golden file. the data contains relatively inconsequential details, such as boilerplate text or formatting, which might be changed frequently. By default, the test runs non-interactively, which is what you want on a continuous integration machine, and it will print a diff if it fails. To switch on the semi-interactive mode which runs Meld, you run the test with the option --meld. # side we usually edit. "Differences from golden files found.\n"
"Try running with --meld to update golden files.\n"
Golden tests have the same sort of advantages that are associated with test-driven development in general. Sometimes you can point people at the golden files if they want to see example output. For HTML, sometimes you can contrive the CSS links to work so that the HTML looks right when viewed in a browser. And of course, this can catch cases where you didn't intend to change the program's output. My typical workflow is to add a test with some example input that I want the program to handle, and run the test with --meld until the output I want comes up on the left-hand side in Meld. I mark the output as OK by copying it over to the right-hand side. This is not quite test-first, because I am letting the test suggest what its expected output should be. But it is possible to do this in an even more test-first manner by typing the output you expect into the right-hand side. Other times, one change will affect many locations in the golden files, and adding a new test is not necessary. It's usually not too difficult to quickly eyeball the differences with Meld. On the other hand, sometimes the overhead of having a separate file isn't worth it, and if the expected output is small (maybe 5 lines or so) I might instead paste it into the Python source as a multiline string. It can be tempting to overuse golden tests. As with any test suite, avoid creating one big example that tries to cover all cases. (This is particularly tempting if the test is slow to run.) Try to create smaller, separate examples. The test helper above is not so good at this, because if you are not careful it can end up running Meld several times. In the past I have put several examples into (from unittest's point of view) one test case, so that it runs Meld only once. Golden tests might not work so well if components can be changed independently. For example, if your XML library changes its whitespace pretty-printing, the tests' output could change. This is less of a problem if your code is deployed with tightly-controlled versions of libraries, because you can just update the golden files when you upgrade libraries. A note on terminology: I think I got the term "golden file" from my previous workplace, where other people were using them, and the term seems to enjoy some limited use judging from Google. "Golden test", however, may have been a term that I have made up and that no-one else outside my workplace is using for this meaning. If you can, keep the ABI the same. If you can't keep the ABI the same, at least keep the API the same. Don't be tempted to say "we're changing X; we may as well take this opportunity to change Y, which has always bugged me". Only change things if there is a good reason. For an example, let's look at the case of GNU Hurd. In principle, the Hurd's glibc could present the same ABI as Linux's glibc (they share the same codebase, after all), but partly because of a different in threading libraries, they were made incompatible. Unifying the ABIs was planned, but it appears that 10 years later it has not happened (Hurd has a libc0.3 package instead of libc6). Using the same ABI would have meant that the same executables would work on Linux and the Hurd. Debian would not have needed to rebuild all its packages for a separate "hurd-i386" architecture. It would have saved a lot of effort. I suspect that if glibc were ported to the Hurd today, it would not be hard to make the ABIs the same. The threading code has changed a lot in the intervening time. I think it is cleaner now. The Hurd's glibc also changed the API: they decided not to define PATH_MAX. The idea was that if there was a program that used fixed-length buffers for storing filenames, you'd be forced to fix it. Well, that wasn't a good idea. It just created unnecessary work. Hurd developers and users had enough on their plates without having to fix unrelated implementation quality issues in programs they wanted to use. This pops an address off the stack, rounds it down to the nearest 32 byte boundary and jumps to it. If the calling function's call instruction was not placed at the end of a 32 byte block (which NaCl's assembler will arrange), the return address will not be aligned and this code will jump to the wrong location. We can reuse the relocations mechanism to store these rewrites. The crafty old linker already does something similar for thread-local variable accesses. When it knows that a thread-local variable is being accessed from the library where it is defined, it can rewrite the general-purpose-but-slow instruction sequence for TLS variable access into a faster instruction sequence. The general purpose instruction sequence even contains nops to allow for rewriting to the slightly-longer fast sequence. This arrangement for running NaCl-compiled code could significantly simplify the process of building and testing code when porting it to NaCl. It can help us avoid the difficulties associated with cross-compiling. What does NaCl mean for Plash? Google's Native Client (NaCl), announced last month, is an ingenious hack to get around the problem that existing OSes don't provide adequate security mechanisms for sandboxing native code. NaCl uses a code verifier to prevent use of unsafe instructions such as those that perform system calls. This is not a million miles away from programming language subsets like Cajita and Joe-E, except that it operates at the level of x86 instructions rather than source code. Since x86 instructions are variable-length and unaligned, NaCl has to stop you from jumping into an unsafe instruction hidden in the middle of a safe instruction. It does that by requiring that all indirect jumps are jumps to the start of 32-byte-aligned blocks; instructions are not allowed to straddle these blocks. It uses the x86 architecture's little-used segmentation feature to limit memory accesses to a range of address space. So the processor is doing bounds checking for free. Actually, segmentation has been used before - in L4 and EROS's "small spaces" facility for switching between processes with small address spaces without flushing the TLB. NaCl gets the same benefit: switching between trusted and untrusted code should be fast; faster than trapping system calls with ptrace(), for example. /proc/self doesn't work, and Plash's architecture makes it hard to emulate /proc. Interface changes mean some programs require patching, e.g. to not depend on /proc. If there were more people behind Plash, these interface changes wouldn't be a big problem. These problems can be addressed, with work. But Plash hasn't really caught on, so the manpower isn't there. NaCl also breaks the ABI - it breaks it totally. Code must be recompiled. However, NaCl provides bigger benefits in return. It allows programs to be deployed in new contexts: on Windows; in a web browser. It is more secure than Plash, because it can block network access and limit the amount of memory a process can allocate. Also, because NaCl mediates access more completely, it would be easier to emulate interfaces like /proc. NaCl isn't only useful as a browser plugin. We could use it as a general purpose OS security mechanism. We could have GNU/Linux programs running on Windows (without the Linux bit). Currently NaCl does not support all the features you'd need in a modern OS. In particular, dynamic linking. NaCl doesn't yet support loading code beyond an initial statically linked ELF executable. But we can add this. I am making a start at porting glibc, along with its dynamic linker. After all, I have ported glibc once before!